The $210 million Shimao Wonderland InterContinental, located 30 kilometres from Shanghai, has been built in an abandoned quarry that plunges 80 metres below ground level. The 61,000sq m hotel has been designed by Studio JADE+QA in association with Atkins, the British firm responsible for the well-known Burj Al Arab Hotel in Dubai. According to a report in The Urban Developer, 16 of the hotel’s 18 floors, which hug the wall of a deep pit, will be built underground and two will be submerged inside a 10-metre-deep aquarium. There will be 336 guest rooms and an underwater restaurant, built with sustainability in mind – the hotel’s structure mainly confined within the walls of the quarry to minimise its environmental impact. In addition, the hotel plans to generate its own geothermal and solar energy to power everyday functions. Each guest room will feature a balcony with views of purpose-built waterfalls spilling down the quarry walls. Set near the Sheshan Mountain Range, Sheshan National Forest Park and Chenshan Botanic Gardens, the hotel aims to be a base for environmentally minded travellers. The project initially broke ground in 2012, but construction did not start until late 2013 and the project has been beset by several delays. One such project involved pumping concrete downward by 80 metres without blockages, or separation of sand and cement. Engineers counteracted this issue by changing the ratio of constituent materials and adding a damping device to slow its descent. Approximately 5,000 architects, engineers, designers, and construction workers have been involved with the mega-project. Over the course of a decade of construction work, experts developed a range of technological solutions to overcome the project’s unique challenges and filed a total of 39 patents to protect them. 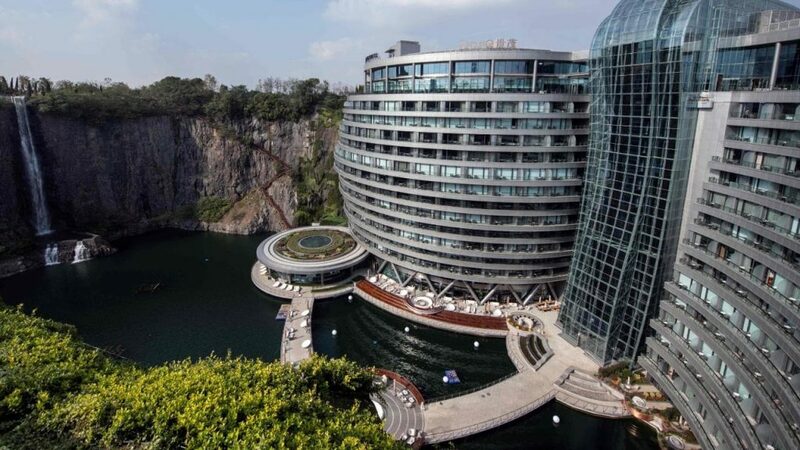 After it opens, the hotel expects to welcome 500,000 visitors each year, who will have the chance to enjoy water sports on the lake and rock climb or bungee jump off the surrounding cliffs.